But in Obama’s old home base, one group was determined to celebrate the past eight years, which for many represented a paradigm shift in what it means to be traditionally American. Tanikia Carpenter, a local filmmaker and co-founder of Black Owned Chicago, created a short film, Farewell, Obama, to pay tribute to the first African-American president. On January 19, the group held a screening of Carpenter’s film at Harper Theater in Hyde Park, where Obama’s political career began over a decade ago. Farewell, Obama is the first documentary produced by Black Owned Chicago, which Carpenter and her husband founded this past June primarily to serve as a network for black business owners and a resource for locals and tourists looking to support black-owned businesses. Before the screening, Stevie Wonder’s “Signed, Sealed, Delivered” played as guests gradually filled in the lobby. Many sported Obama T-shirts from 2008 or 2012; just for the occasion, Carpenter’s father-in-law, Tony Carpenter, took his old Obama baseball cap off the wall. Guests posed for photos holding cutouts of the Obama family’s faces and collected goody bags stuffed with gifts from local black-owned businesses. “Tonight, let’s celebrate, because tomorrow we’ll probably be weeping,” Carpenter said as she introduced the film and people took their seats. Originally, the budding filmmaker set out to record a five-minute video on Facebook capturing messages of gratitude and well-wishes to the president from other Chicagoans. But when Carpenter spoke to Patricia Blessman, a prominent Chicago-based donor interviewed in the film, she realized five minutes would not suffice. Blessman connected Carpenter with so many other campaign workers, friends, and supporters that she eventually generated enough material for a thirty-minute short film. She decided she would tell the stories of those who rubbed elbows with Obama before he was a household name. The film opens with scenes of the South Side as Carpenter’s voice explains how she came to support then-Senator Obama during his presidential campaign. The campaign’s message, “Yes we can,” gave her hope that her voice as a black woman, for once, could be heard. She would later attend his inauguration, which she called “the blackest inauguration ever.” She recalled proud grandmothers in fur coats and the indescribable feeling of hope as the nation swore in its first African-American president. The cast of characters includes White House staffer Toniann Liota; Johnny Calamusa, manager of Obama’s favorite Hyde Park restaurant, Valois; Jocelyn Woodards, former director of Camp Obama; donors Stephen and Patricia Blessman; Obama’s barber; Bishop Peachman of Trinity United Church of Christ, and several others. Some anecdotes in the film, ranging from Obama’s days as a senator to his final months in the White House, were poignant. Kati Murphy, a white member of Obama’s administration staff, described the parallel timing of the adoption of her black daughter with Obama’s election. A black president meant that her daughter would grow up in a world where her worth wasn’t based on the color of her skin, she said. South Siders described saying hello to Obama as he jogged in the street, cutting his hair, serving him breakfast on Saturday mornings, and shaking his hand at book signings. These anecdotes reinforced the image of the Obama we know so well: an electrifyingly charismatic man at once both cool and nerdy, graceful under pressure and optimistic against the odds. 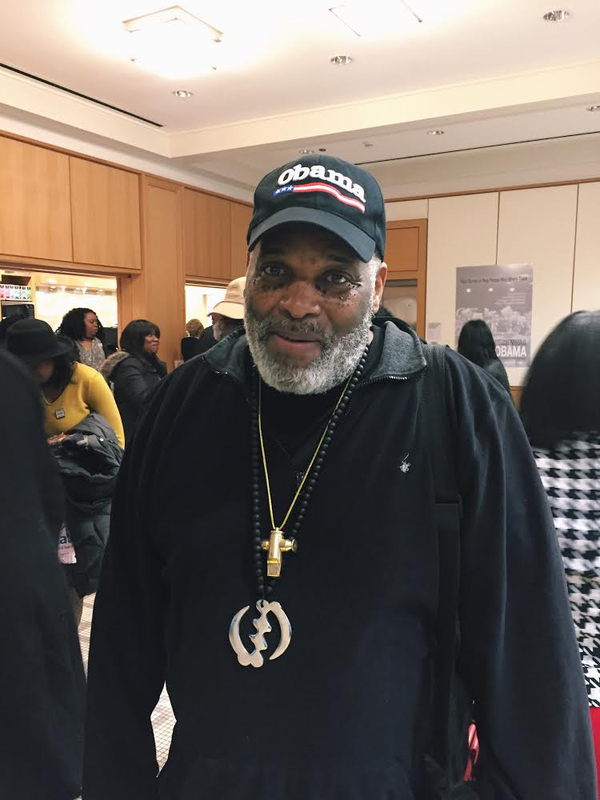 More than anything, the film showcased the treasured memories Chicagoans hold of their former neighbor, fellow churchgoer, boss, customer, and friend. Toniann Liota, an Obama campaigner turned White House staffer, described more private moments with the president that spoke to his authenticity. After Sandy Hook, she recalled in the film a conversation with the president where the question was not about strategizing, but rather how they would all support each other in such a dismal time. “He was just as much a citizen as a leader,” Liota said. After the film, about half a dozen of the individuals featured rose from their seats to start a panel discussion focused largely around the question: Now what? “Once you’ve had a really great boyfriend, you can’t go back to trash,” Blessman said to chuckles from the audience. Though Obama may not be universally appreciated by Americans, Blessman’s husband Stephen added, his legacy will be lasting. Several panelists mentioned the Obama Library in Jackson Park as a project to look forward to organizing around, and urged the audience to stay engaged in various forms of activism, from frequenting black-owned businesses to starting civil conversations with people who harbor opposing political views. Carpenter is already doing her part. The filmmaker will soon start fundraising for her next documentary about black entrepreneurship on the South Side. Under the new administration, Black Owned Chicago will continue its aim to elevate black excellence, a lasting tribute not only to Obama, but also to the community that has supported him from day one. I was there! The documentary was amazing! So was the food, the music, networking and the celebrating! Such an amazing atmosphere! I was proud to be a Chicagoan that night. The future looks bright. Salute to Tanikia Carpenter and team. Job well done. And salute to “South Side Weekly” for this piece.